Unemployment: Difficult Business Facing the Palestinian Reconciliation? Unemployment in Gaza doesn’t only affect those having no jobs, but it also has a very negative impact on those having simple jobs. Being a butcher, a grocery or a vendor is not that job that you can really depend on during in your daily life in the Gaza Strip. The rate of unemployment among the youngstersin this Palestinian territory rose to more than 42%, while it’s 27% in the West Bank. On the other hand, the number of the unemployed graduates in Gaza is more than 150,000, which means this young generation’s future is already at stake. We had a short tour in the Gaza markets, especially Al-Zaweya market, which for Gazans is considered an old market in the Palestine Forum. Al-Zaweya does not have that much of buyers, which made the general atmosphere of this ancient market very dim. We interviewed a grocery who told us that there is a difference between selling fruits and vegetables nowadays and in the Past, before the start of the political division between Fatah and Hamas. Right in front of this grocery, we saw this vendor who is considered, by the people of this old market, the spokesman of Palestine Forum. He is always ready to talk to any news agency coming to interview him. He usually talks about the economical and the political situations in Gaza. This “spokesman” has witnessed the Egyptian army, the Israeli occupation, the Palestinian Authority and Hamas government when governed Gaza, which strengthened his knowledge in knowing most of the situations of the Gaza Strip. “The economic situation is very difficult. In the past I sold amounts of goods, but now most of my goods get rotten because people cannot buy anymore.” He continued while it was raining. The vendor’s children are graduates but with no jobs. They have an engineer, a math teacher and an English teacher, but none of them are employed. “The reconciliation is the only hope we have now. Unlike other times, we really depend on it this time, and we are very optimistic.” The vendor imagined. “In the past, the price of one kilo of meat was more than 60 NIS (17 USD), but now it’s about 30 NIS (8USD) and people can’t buy it.” The curious butcher continued. This butcher was the most famous in Al-Zaweya market, but this division and the siege affected his whole life, and he became just a simple seller people see as an item. The bottom line? Eyes of Palestinians residing in the enclave are open waiting to see the reconciliation and its results on the real life in Gaza. Women, men, kids and elders have been waiting for this moment, which first step will appear on November 1st, when the Palestinian Authority will hand over the Gaza crossings. Apparently, this reconciliation became the only dream Palestinians have to start a new life full of happiness and joy, just like the rest of the world. A Palestinian- Finnish journalist came to cover the humanitarian situations in the Gaza Strip, especially in Al-Shujaeya neighborhood, where the last war on the enclave started and ended. We met this Gaza Family that is just like any other family residing in Gaza. Well, this family has 12 members, five boys and five girls. They lived just fine before the first, second and third war. After the end of the 2008 war, however, one of the family kids, 16, had epilepsy because of what he has witnessed during this war. His situation made the family’s life upside down since they couldn’t and can’t afford to get his special treatments due to the unemployment of the father and the siege. Another kid of this family, 10, had the same disease right after the third war on Gaza in 2014. It was caused when this kid, along with his family, evacuated the family home escaping to a shelter. On his way, he was walking on corpses of women, kids and elders, which made him have this seizure. We interviewed the mother, Ferial, who seemed so lovely and kind to her family, especially these two kids. Yet, she is still afraid that their status gets worse due to the expensive price of the medicine they take and the electricity crisis. The family loved us, so we stayed with them until the evening when there was no power but the dim light of the moon and the stars. The area this family lives in is empty and closer to the Eastern Gaza-Israeli Borders, where you can not find a taxi during the afternoon, and where you can easily hear the buzzing of the Israeli reconnaissance drones hovering in the sky. Because of the power crisis that was deepened and worsened recently due to political issues between Hamas and the Palestinian Authority, most of Ferial kids sleep outside the house during the summer, where they find themselves full of mosquito bites. During winter, they just light a small fire and make a kettle of a tasty tea while gathering around it to warm themselves up. “They have promised us enough, but they did nothing yet. However, we still are hopeful that the reconciliation can solve all of our problems, starting with electricity crisis.” The father imagined. Apparently, living in Gaza is not easy, but it can be less difficult with determinations and hopes. People here are different from other parts of the world; they are steady and mighty, just like when the former Palestinian President, Yasser Arafat, deceived the people of Palestine with, “The mighty nation”. Everyone who follows news about Gaza (which sometimes I think are very few) knows how short we are on electricity, a commodity that is so basic most other people around the world take it for granted. These days, we are “blessed” with only about four hours of power a day—forcing every aspect of our life to be calibrated according to when we have electricity. Gaza has only one power plant of its own, which runs on fuel purchased from Israel, supplemented by the Egyptian electrical grid when available and donations from countries such as Turkey and Qatar. However, the power plant can only run at reduced capacity, since it has been damaged repeatedly in past wars, with repair parts not allowed in due to the Israeli blockade. In addition, each link in the supply chain is at the mercy of politics and manipulation—and the result is a chronic shortage, with Gaza’s 2 million people the victims. What most people don’t know, however, is that if allowed, Gaza could be energy-independent: It has its very own gas field, off the coast in the Mediterranean. While surfing the internet, I found a 17-year old article about the field, reporting that the late Palestinian president, Yasser Arafat, had given the green light to start gas exploration. Discovered 28 years ago, the Gaza Marine Gas Field is located 30-36 kilometers (19-22 miles) off the coast, at a depth of 603 meters. The field’s estimated reserves are about one trillion cubic feet. That’s not large enough to allow Palestinians to export, but it could allow us to be self-sufficient—providing electricity as well as cooking gas. Arafat also believed the field would lead to peace between Palestinians and Israelis “because this will make Palestinians depend on themselves and self-sufficient.” And in fact, the president of the Palestinian Power Authority at the time, Abdul Rahman Hamad, expected that extraction would start in 2003. In preparation, a license for exploration and production was awarded to BG Group, a major British oil and gas company. Unfortunately, the First Intifada ignited in September 2000, and Israeli forces prevented Palestinian access to the gas field (in contravention of the 20-mile Palestinian zone of control set by the 1993 Oslo Agreements). That blockade continued when Hamas won control of the Gaza Strip. According to Al-Shabaka, Israel initially prevented the development of the field to assure it could buy the gas on commercially favorable terms. It was only later, after Israel discovered its own resources, that it began citing “security concerns” as an excuse for preventing development. Many Palestinian officials and journalists argue that the gas field was a driving force behind Israel’s three wars against Gaza, with one of the goals to prevent Palestinians from having independent energy resources—and thus, taking a key step toward real independence. A confrontation now is brewing, since one of the first steps of the Palestinian consensus government is to develop a plan to capitalize on this treasure. Developing the field would cost an estimated $1.4 billion, while saving Palestinians about $8 billion per year. “We are finalizing all of the needed procedures to start extracting gas from the field,” says the acting head of the Palestinian Power Authority, Zafer Melhem. Although BG has since been acquired by Shell, which announced its plans to withdraw from the project this year, Palestinian government officials say they are forging new deal with a Greek company. Zafer says the extracted gas will be used to generate electricity for both Gaza and the West Bank (through a plant in Jenin), and will be available by 2020. Yet, Israeli authority hindered installing gas pipes in the station recently, and it needed to only use its own pipes for transferring the gas. The bottom line: Independence is the dream of every Palestinian. We could achieve that if allowed; we have everything we need. But will we be allowed to breathe on our own, or kept on life support? The shocking images of devastated houses and villages and terrified Rohingya Muslims pouring into Bangladesh with babies on their backs and almost nothing else remind me of the experience of my great-grandfather’s generation during the Palestinian exodus (Nakba), when so many of my people were forced from their homes to make way for Israel in 1948. My great-grandfather is a native of Gaza, but during the Nakba (catastrophe), he used to hire out to farms in Jaffa (Haifa) and other now-occupied cities. But that ended at the same time that refugees flooded into the Strip. Israeli (Jewish) forces expelled more than 700,000 Palestinians from almost 600 sacked villages. They were forced to settle in refugee camps inside Gaza, the West Bank and neighboring countries. Even today, more than 1 million Palestinians still live in eight refugee camps in Gaza; the largest (Jabalia) houses about 110,000 people. I understand why the Rohingyas are being called “the new Palestinians.” We hear their own catastrophe was triggered when Myanmar forces were attacked by a violent Rohingya faction, killing nearly 100. But Amnesty International has said “at least hundreds” of Rohingya civilians now have been killed by Buddhist forces, and more than 500,000—60 percent kids (14,000 of whom have lost at least one parent)—have been forced to flee into Bangladesh. I call that a “disproportionate” response—a term we know well in Gaza. Just a few rockets shot by an armed group here (typically not killing anyone) usually triggers a massive Israeli response, terrorizing and even killing thousands. The Muslims of Myanmar have seemingly joined Palestinian among the ranks of the most persecuted minorities on the planet. Both peoples are victims of colonialism and imperialism, since Israeli and Myanmar officials seem intent on “cleansing” us from their land. Israel wants all of historic Palestine—which used to be home to the three Abrahamic religions—for a Jewish state, while the government of Myanmar refuses to recognize the Rohingya Muslims as a legitimate ethnic group. A Palestinian boy sits on a sofa following the October 2016 demolition of his family’s home. Israel’s tactics against the Palestinians continued after the Nakba; another wave of massive persecution and forced displacement took place in 1967 when its forces occupied the West Bank and East Jerusalem. Today, it relentlessly demolishes our homes, particularly in Jerusalem and the Negev. Right now, for instance, 100 homes in the Silwan Valley of the West Bank are slated for demolition to make way for an “archaeology park.” Moreover, Israel continually expands its illegal settlements on Palestinian lands in its efforts to Judaize Palestine. Just this month, Israeli Prime Minister Benjamin Netanyahu approved building plans for 3,736 new units in Jewish settlements in the occupied West Bank. About 75 percent of originally Palestinian land now is populated by Israeli Jews; it was just 30 percent in 1946, before the Nakba. Likewise, in Myanmar, satellite images and interviews with refugees revealed that about 1,500 buildings have been destroyed in the attacks, with 200 villages completely burned down. The 2014 census documented that the country’s Muslim population had fallen from 3.9 percent to 2.3 percent in the wake of the relentless campaign against them, and it is surely much less now. Israel denies visas to Palestinians living abroad so they cannot visit their ancestral lands. It also limits the ability of those living in the occupied territories to travel freely to other areas, abroad or even locally. Palestinians from the West Bank rarely are allowed to visit the Gaza Strip and vice versa; the majority are denied for “security reasons.” A host of other rights—for example, for Gazans to export goods or to fish beyond six miles in our own sea—are denied as well. Similarly, Rohingyas in the coastal Myanmar state of Rakhine are not allowed to leave without government permission. Any moves to create their own state are denied, yet they have been deprived of the rights of citizenship since 1982. That sounds so very familiar! And here’s another similarity: refusal to respect international conventions and resolutions. In 2016, for example, Israeli Prime Minister Benjamin Netanyahu ignored a UN resolution calling for the end of illegal Jewish settlements in the West Bank. Likewise, in June, the Myanmar government refused visas for members of a UN team charged with investigating the abuse of Rohingya Muslims. It is no surprise, then, that Israeli companies supply the Myanmar military with weapons, refusing to comply with calls for an embargo. More than 100 tanks, as well as boats and light weapons, have been sold to the Myanmar government by Israeli arms companies in recent years. One company, TAR Ideal Concepts, has also trained Burmese special forces in northern Rakhine state, where much of the violence is taking place. Curious whether most Gaza youth were aware of what was happening to the Rohingyas, as well as the sickening parallel with Palestinians, I asked a few of my university friends. They too saw history repeating itself. Mariam is right when she said the world is silent. Israel founded its state on Palestinians’ bodies, leaving us stateless on our own land. Yet the international “community” has allowed its colonization of us to continue for more than 60 years. The atrocities of the Myanmar military are attracting attention now, but for how long will that last before the world’s fickle attention goes elsewhere? GAZA CITY – I entered the big gates of the largest hospital in the Gaza Strip to visit a sick relative. The hospital yard resembled an expansive factory: it was full of massive generators, roaring at high decibels to supply patients power for their medical equipment, including ventilators for babies who depend on the oxygen supply to survive. Al-Shifa’s open spaces have become generator-land because there hasn’t been a reliable electricity supply here, or anywhere in Gaza, since June. That’s when Palestinian President Mahmoud Abbas requested that Israel reduce electricity purchases and supply to the Gaza Strip in order to pressure Hamas, a request to which Israel acquiesced. I couldn’t find my relative’s room. But on my search, I saw a mother, followed by female family members, leaving the Neonatal Intensive Care Unit (NICU) weeping after their infant had passed away. The child had seemed healthy when he was born, but then he deteriorated. As a result, he was moved to the NICU unit at Al-Shifa hospital, where the doctors did their best to keep him alive, but weren’t able to him – a child for whom his parents had waited four long years. He died because the treatments that could have saved him are only available outside of Gaza – and there was no way out. His parents wanted to name him Ahmed. But he was not the only child who has fallen victim to the decade-long siege that has affected every sector of the Strip. Dozens of other kids have died due to the lack of facilities at hospitals, the impossibility of eliciting exit passes that would enable treatment abroad, and the lack of electricity for life-saving equipment. 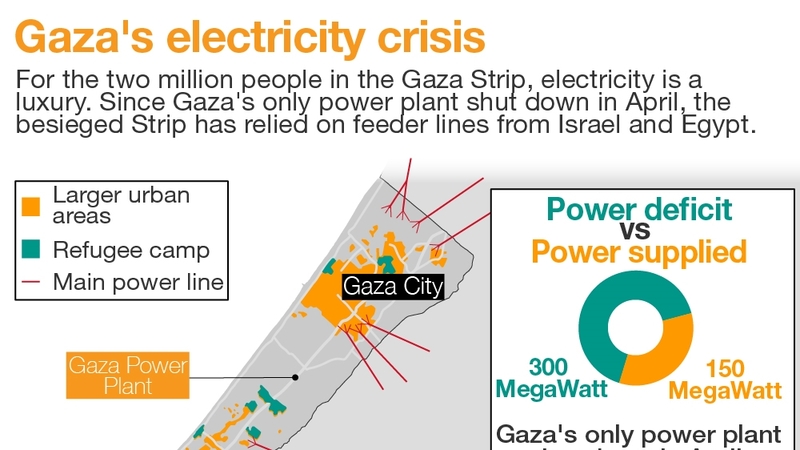 Gaza still only has access to electricity for four hours a day. From inside that unit, I heard the beeps of incubators. It was surprising to see there were three or four babies lying together in the same incubator. At the door, I met Dr. Allam Abu Hamida, director of the intensive care unit, who said that in addition to the incubators, power is the lifeline for those babies, and that if it is cut, most of these babies will die within seconds. Many of the babies in the unit, which only has 10 incubators, are premature, and some weigh less than 1000 grams. Dr. Allam says his unit faces a shortage of staff, of supplies – a shortage of everything, leading to disastrous consequences. Those generators, keeping the vulnerable alive, might still stop at any time, if the new Palestinians consensus government doesn’t act. 20 hours of power produced by Al-Shifa’s generators costs at least $3,500. That’s the daily cost for 2,000 liters of industrial fuel, and it’s money the hospital can’t afford. But, despite the Palestinian reconciliation agreement, there’s still no sign that Abbas has requested from Israel a return to the electricity supplied before Fatah-Hamas tensions ratched up. The International Committee of the Red Cross has already warned that Gaza might soon experience a systemic collapse, while the UN warned even before the electricity crisis that Gaza may not be habitable by 2020. Several of the medical staff I spoke to explained the damage that the Palestinian Authority’s payment freeze on Gaza public sector wages has caused them. One described receiving only 40% of her salary, which isn’t enough to provide food for her own kids. For the families of newborns in intensive care, there were mixed emotions: some were waiting for their babies to be discharged, others were praying that their kids would survive. Ahlam Melhem, who had newborn triplets lying in an incubator together, was happy but worried. Along with her unemployed husband, she was staring at the oxygen machine through which her infants were breathing. Khalid Ahmed and his wife were sitting beside an incubator in which a 700 gram infant lay. Khalid was attempting to comfort his wife. Can the reconciliation between Hamas and Fatah offer Gazans another chance for stability, for a renewal of basic living standards, for hope in the future? For the medical staff, parents and babies at Al-Shifa, it’s not a theoretical question at all. GAZA CITY – Like their 21th century peers, Gazans have access to cellphones, YouTube and Facebook. But this is only a façade of access to global interaction: For the last 11 years, Gazans have been living under political siege. Last Sunday, after negotiations with Egypt, Hamas government pledged to dissolve its year-old administrative commission, formed to rule the Strip, and expressed its readiness to hold elections. Hamas used its commission to run the internal affairs of the Strip, after accusing the PA of neglecting Gaza. In return, the Fatah-ruled PA accused Hamas of using this commission as a “shadow government” to deepen the political division between Gaza and the West Bank. The last Palestinian-Palestinian reconciliation agreement was signed by the two parties in the summer of 2014, a month before Israel started its deadly offensive on the enclave. The subsequent war, lasting for 52 days, damaged Gaza’s weak infrastructure and killed more than 2,300 Palestinians, the majority of whom were civilians. Patients waiting for medications to get into Gaza, students granted scholarships to study outside Gaza waiting for the border crossings to open, the crowds of the unemployed. As we all used to hear from our grandparents: “A drowning man grasps at straws. The besieged Gaza strip has a lot of hidden stories the media can’t properly access. Those stories are populated by individuals who won’t reveal their names and details to outsiders, out of pride, or privacy, or shame. Every story has its own shocking and surprising details. They need to be told so a wider audience can begin to understand, just a bit more tangibly and personally, what it means to live in the enclave. In Gaza, we also fall in love. Sometimes we fall in love with a cousin, a friend or even a student. She was just 17 years old when she came to the educational center where I was volunteering as an English teacher. The head teacher asked her mother to choose the teacher who would instruct her daughter. But her daughter intervened. She pointed directly at me. I knew that would be the beginning of a love story. Over the next eight months, she and I finally fell in love. Her family knew, but mine did not, because I knew my family was not financially ready for a marriage. Immediately, I realized the mistake I had committed by allowing such a deep attachment to grow. I am my parents’ eldest son. They want me to marry so they can enjoy being grandparents, but they know that I don’t have a apartment to live in or a stable salary that would allow me, my wife and them to survive on. My father has been unemployed since 2005 when he, along with thousands of other Gazans, could no longer work inside Israel after its withdrawal. He became one of the 80% of all Gazans who depend on social assistance and international aid. My girlfriend’s parents loved me so much that they said they could not live without me. “If you ever leave us, you will kill our souls,” her mom once told me. Her words made me cry for hours, because I already knew marrying her daughter would never happen. I felt trapped between Scylla and Charybdis. I was afraid to be realistic and to tell her family that financial difficulties prevented me from marrying their daughter, and I was also scared to promise the girl and her family to wait for me, and for my situation to improve, because I did not want them to wait for years. Between fear and hope, the relationship lasted for about two years, and she was almost 20 years old when her mother asked to meet me alone. I knew what her mother wanted to talk about. I met her in a restaurant in Gaza, popular with families, and she started talking about the social culture of Gaza and how people regard young women when they pass the age of 20. In Gaza, and in most of the Arab world, families consider girls over 20 as irredeemable spinsters. That means many have no chance of marrying – for several reasons. There is a gender ‘surplus’ of young single women because so many young men immigrate to the West looking for jobs, because men disproportionately lose their lives in combat, and because men don’t have the financial means to get married. It was for her right to say that, and that day I felt the most guilty and oppressive person on earth. I realized how much her family was attached to me, and how much they needed me to be one of them. I couldn’t give my answer there and then. I asked her mother to give me a few days to think. Gaza’s difficult financial conditions, including an unemployment crisis that exceeds 45%, one of the highest in the world, stifle the chances of hundreds of marriages ever taking place. That has led to the proliferation of organizations that facilitate weddings. Their main role is to help people who don’t have the financial means to marry. Because every wedding in the Gaza Strip costs at least $8000, these organizations provide grooms opportunities to pay in comfortable installments over two or three years. I thought of going to register at one of these organizations, but I was very hesitant. I knew that everyone in the neighborhood would know I married through them, and that it’s considered shameful. I didn’t want anyone to talk badly about me. Moreover, I would not be able to pay the installments back, so I would fall in a dangerous financial trap; I would likely default, and I might even go to jail. So I eradicated the idea of marriage from my mind. I called her mother, and told her that I would not let her daughter or her wait for me. I would not be able to marry for years. She cried over the phone several times, but I still felt I did the right thing. That was two years ago. Until now my ex-girlfriend has refused every marriage proposal suggested to her. Her mom once called me and said that her daughter was suffering psychological difficulties. That day, I understood what living in the Gaza Strip means.